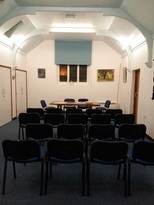 The Vestry Room offers the perfect space for meetings and training events , smaller private parties, community groups and fitness classes for between 2 – 35 people. Our building is entirely wheelchair accessible and a hearing loop is available. We also offer free WiFi throughout the building. We have a digital projector and screen available to hire and can offer tea/coffee/soft drinks at an reasonable rate. If you need a larger space, see our Conference page for details of our Main Hall which has a capacity of 200. Follow us on twitter @Stjohnsarc or why not like us on Facebook.